I decidedly did not have high expectations from this series ever since I read Every Heart a Doorway and ended up feeling quite whelmed about its half-cooked murder mystery plot that severely underutilized its amazingly well-developed set of characters across a range of gender and sexual orientations. However, after having read and adored Down Among the Sticks and Bones, I can’t help but wonder how is it even set in the same universe as Every Heart a Doorway like this is exactly the content I was here for in the first place. 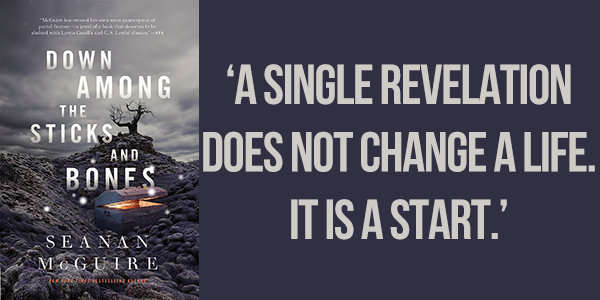 Down Among the Sticks and Bones is as atmospheric as it gets and that is, in part, due to its evocative setting of the Moors. What starts out as a tale with subtle dark undertones brewing under the surface, in a way that you just know in your bones that this story is not supposed to end well, slowly and steadily edges toward a world wholly shrouded in darkness and it is exactly as amplifying in its intensity as it sounds. To that extent, Down Among the Sticks and Bones is much like the countless stories of what happens when two people that are highly unequipped at best and not really meant to be parents at worst act on their ill-advised allure of well-behaved children. While it isn’t always traumatic for the children for their parents to have some hopes and expectations from them, putting insensible restrictions upon them anywhere from enforcing them into strict gender roles to discouraging particular habits from forming never does them, let alone anyone else involved in such a situation, any favors. It always ends in one form of disaster or another that either ends in identity crisis levels of utter rebellion or acute submission and the twins are no exception. However, it’s not only the Wolcotts who can be held responsible for bending the twins’ personalities so excessively. The Moors were never easy on the twins as the Master and Dr. Bleak further shaped them into two different kinds of monsters but monsters all the same. For Jack and Jill, exchanging one kind of authoritative figure with another comes with its own set of expectations. Destined to deal with death in their own ways, Jack finds love in the form of a resurrected girl while Jill falls deeper into a life of isolation born out of conditional love. Naturally, towards the end, it’s far easier to sympathize more with Jack than it is with Jill. Yet they’re each a result of their own circumstances and in my view, both twisted in such ways that while sating their deep-rooted desires to do and be exactly what their parents denied them for so long also exploited them so oh so well. So really, the moral of this particular tale is that it’s the adults that should be feared at all times. Other things of note are the ever-shifting sisterly dynamics that come into play from the beginning encompassing all the stages of a sibling relationship from the hating-each-other-with-a-hot-passion to maybe, just maybe all is not yet lost. It is thought-provoking like all fairy tales are meant to be and the style of omniscient narration works wonders for the story and its pacing. Heart-wrenching and cautionary, Down Among the Sticks and Bones is a modern fairy tale with razor sharp teeth and a slant of light at the end of the tunnel or in this case, at either ends of a staircase. Ayyyy back at it again with the reviews! Noice. I actually really liked Every Heart (I don’t mind a half baked murder plot tbh) but Jack and Jill were my fav characters, so I’m stoked to hear that this one did their stories justice. Maybe it’s an only child thing but I am always 100% down for complex sibling relationships. They’re just so outside of my own experience! I love your reviews, Sana! This is my favorite book in the series, so I’m glad you enjoyed it. Reading your review is making me crave a reread. Also, I second what Danya said at the end of her comment, haha. Such a good review for this amazing novella! I really admire the way you use words to shed light on the different aspects of this dark story! Also great choice of quotes!